Conference in Tampa, Fla. A UMNS photo by John C. Goodwin. The General Conference on April 30 decided not to approve a petition that would have created a new full-time role for the president of the United Methodist Council of Bishops. Calendar item 219, Petition 20314, received a simple majority of 55.12 percent of the vote in favor, but it fell short of the two-thirds total required to pass because it dealt with a paragraph of the denomination's constitution. The petition stated that the council "may elect from its active membership a full-time president" who also would "be relieved from residential responsibilities" while in that office. Both the outgoing council president, Bishop Larry Goodpaster of Western North Carolina, and the Superintendency Legislative Committee chairperson, the Rev. Ellen Alston from Louisiana, appealed for passage of the proposal, which was first made to the 1968 General Conference. 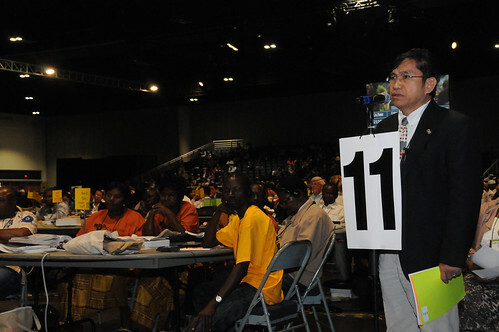 Several delegates rose to express their fear that a full-time council president would have too much power or that the position would be thought of as "the face of The United Methodist Church," whether that was the intention or not. Goodpaster repeated several points that he and other bishops have stressed throughout the process. "This position is to guide and focus the Council of Bishops and to give more time and energy to that." In response to a question from a Liberian delegate as to whether there was anything wrong with the church's current system, Goodpaster said there was really no change in church polity. "This office would be a person who would guide the mission of the church," he said. "As we live into being a global church, we need to be totally focused and aligned." A motion to have the full General Conference elect the bishop without residential assignment was defeated, as it had been in the legislative committee. Delegates also defeated a substitute motion to create a study commission to bring back a report on the proposal in 2016. "It's been thought about for decades," Goodpaster countered. The proposal to create a position of bishop without residential responsibilities was first offered in 1968 but has never advanced out of General Conference. After the vote Goodpaster pointed out that the council has already taken steps to reform its internal structure and leadership. "The Council of Bishops will continue to devote ourselves to the mission of the church as servants of Christ Jesus," Goodpaster told United Methodist News Service. "The General Conference has decided and we move on with hope and confidence that the mission will be advanced. We will continue to focus our energy on the adaptive challenge and lead our episcopal areas and the whole church toward increasing the number of vital congregations around the globe. "We know that the demands placed upon the president of the council will continue to expand," he continued. "We will all find ways to support and encourage the person elected in every way possible as all of us who have served as president of the council have experienced." News media contact: Maggie Hillery, Tampa, Fla., (813) 574-4837, until May 4; after May 4, (615) 742-5470 or newsdesk@umcom.org.